President Rodrigo Duterte, in his speech during the presentation of firearms handed over by surrenderees from the Abu Sayyaf Group at the Capitol Site in Patikul, Sulu on March 26, 2018, expresses his intent of talking to Moro extremists citing that he is more than interested in hearing the concerns of the Moros. 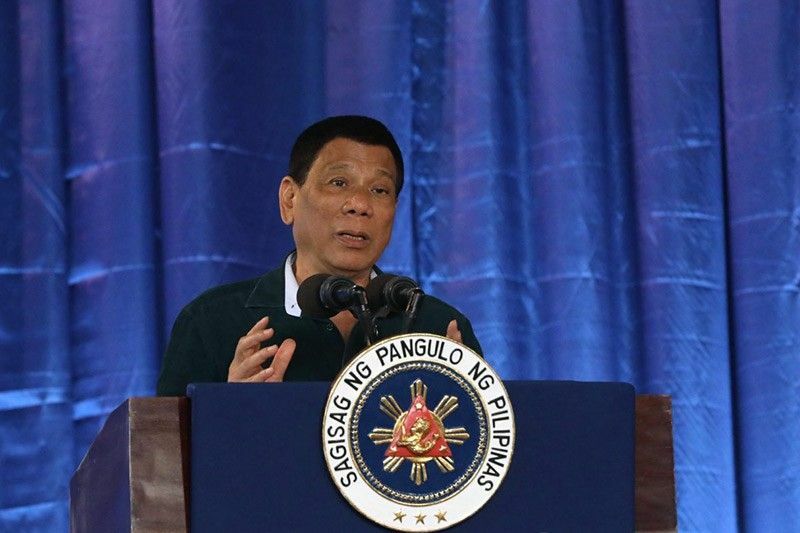 MANILA, Philippines — President Rodrigo Duterte has signed the Bangsamoro Organic Law, Malacañang confirmed Thursday, after he and his officials issued conflicting statements about the matter. "This is to announce that the President has just signed the BOL into law," presidential spokesman Harry Roque said in a text message. Duterte's longtime aide Christopher Go confirmed in a separate text message that the BOL has been signed. The president first announced the signing of BOL during the 69th anniversary of Ipil, a town in Zamboanga Sibugay, at about 5:13 p.m. Thursday. "The BBL has been signed but I will go home for some sort of a ceremony with (Moro Islamic Liberation Front leaders (Ghadzali) Jaafar and (Al-Hajj) Murad (Ebrahim)," the president said. But confusion arose after his announcement was contradicted by his officials. Minutes after the announcement, Roque sent a text message stating that as of 5:43 p.m. the BOL has not yet been signed by the president. Go made a similar statement in a text message sent at 5:18 p.m.
During his visit to fire victims in Zamboanga City minutes past 7 p.m., his second public engagement Thursday, Duterte reiterated that he has signed the BOL. "Napirmahan ko na ang BBL (Bangsamoro Basic Law)," Duterte said, referring to BOL by its old name. "I have no expectations. Not everyone may not like it. Let's see if it can be modified. Those who are disappointed may wage a war," he added. Duterte was supposed to sign the BOL during his third State of the Nation Address last Monday. However, the House failed to ratify the measure because of the leadership squabble in the chamber. The House ratified the measure last Tuesday. The Presidential Legislative Liaison Office confirmed that the BOL was received by Malacañang at 7:30 p.m. last Wednesday. Also Thursday, Duterte said he would like to talk to Moro National Liberation Front founding chairman Nur Misuari to discuss a peace deal so that it could be realized by the end of the year. The only child of two Philippine movie icons is working hard to stay number one.